Its reached that time of year where bare legs are starting to become somewhat frowned upon. When you turn up to meet your friends for a brunch date and their instant response is "Are you not cold?" you know it's time to rethink the no tights situation. The jeans and jumper combo begins to surface from the back of your wardrobes and reality hits that we have a few cold months ahead of us. SOB. I don't know about you but during the winter months I tend to live in jeans, jumpers and boots layered with awesome outerwear because you've got to make your outfit look snazzy somehow. Actually finding a pair of ankle boots that I love as well as ticks all the boxes can be surprisingly difficult. At the start of every season I like to invest in a couple of pairs of boots that will tie all of my autumn/winter outfits together. Are you the same? Typically I go for an everyday pair (usually flat) and also a heeled ankle boot that will transition me easily from day-to-night. Whilst I am all for investing in staple footwear I am fond of a statement shoe which is why I like to experiment with varying trends when it comes to my footwear choices and this season there are so many to choose from. In today's post I've teamed up with Debenhams to give you a head start on the need to know key trends to get you set for autumn/winter. I introduce to you three key trends; high shine, military and suede. Whilst I am a firm lover of a good suede ankle boot, this is something that I already own and surprisingly I was really gravitated towards the high shine trend. PVC is literally everywhere this season from outerwear to footwear so experimenting really couldn't be easier. What I particularly like about these high shine ankle boots is the texture and how they add an element of interest and fun to my outfit. Has Julia Roberts from Pretty Woman sprung to mind yet? I don't know about you but there is something I absolutely love about a stiletto heel and despite what you might think these are extremely comfortable which is crucial for me in my autumn/winter shoe choice. With PVC or high shine being quite a statement in its own right, naturally I kept the rest of my outfit pretty basic with the exception of a slogan jumper because lets face it these are all I seem to live in as of late. I really cannot get enough of camel coats right now either and think they make such a great alternative to a black coat plus compliment these boots and jeans quite nicely I feel. I mean how Autumnal?! I really have been doing my best to steer away from all black everything so this camel coat really is helping me to do so. Whilst I personally found myself drawn to the high shine trend, I can appreciate it may not be for everyone. With that said, I often feel that people are afraid to dabble in the latest trends more because they are uncertain as to whether they have the confidence to pull it off than being a case of actually liking something. Am I right? In my eyes, if you like something you shouldn't be afraid to wear it and I really am loving these boots. 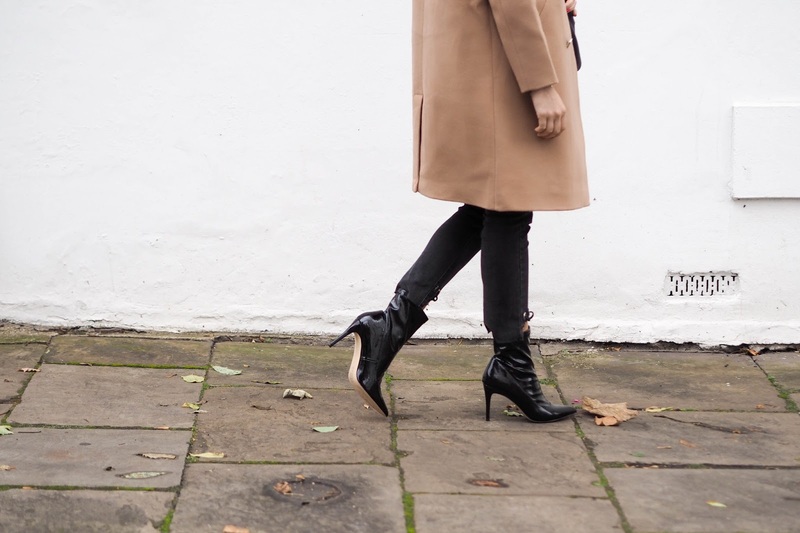 Whether it's high shine, suede or military footwear you'll be rocking this autumn/winter I would love to know which trend is your favourite and better still which boots you'll be sporting to keep those tootsies warm over the next few months. Don't worry I won't judge if you wear your warmest bed socks with your autumn/winter ankle boots because I sure as hell will be doing the same. This post was sponsored by Debenhams. All words, styling and photography are my own. Your look chick in this high boots.These boots are something to die for,so stylish yet suitable with long coats and jeans.Will surely get my hands on these boots.